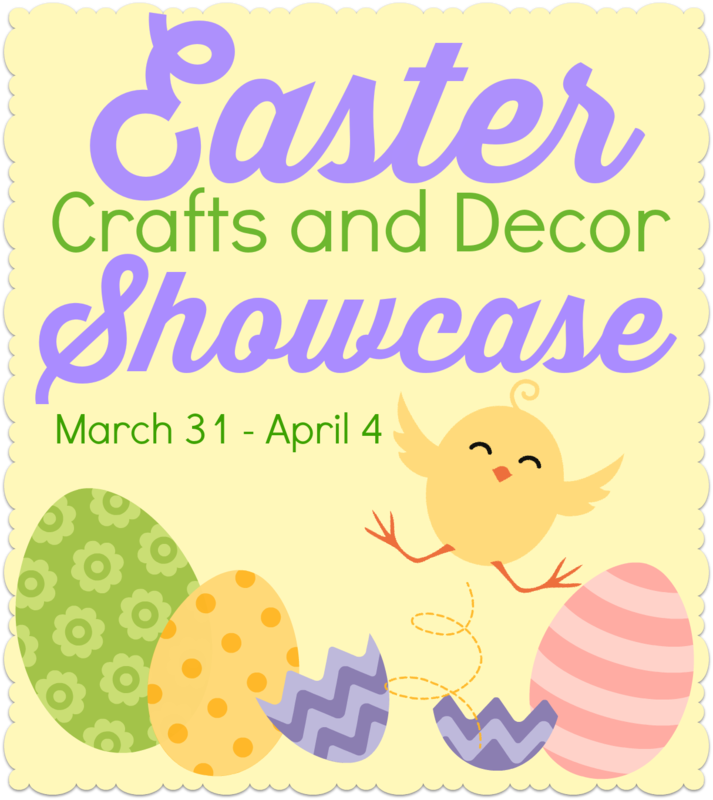 Today I am sharing an Easter Egg Centerpiece as part of the Easter Crafts and Decor Showcase. I hope you enjoy and take time to look at the other great posts shared in the showcase. I am feeling a little old school with this Easter craft. My grandma Grandma Margaret, who I am named after, passed away before I was ever born. My father doesn’t own a lot of things that belonged to her, but he does have some gorgeous Christmas ornaments that she made. Tons of individually pinned sequins and gorgeous embellishments fill our Christmas tree year after year. I used to sit in front of the tree at night and watch how the lights bounced off the sequins, giving the tree a little extra glow. They are really beautiful and a favored treasure among my family. 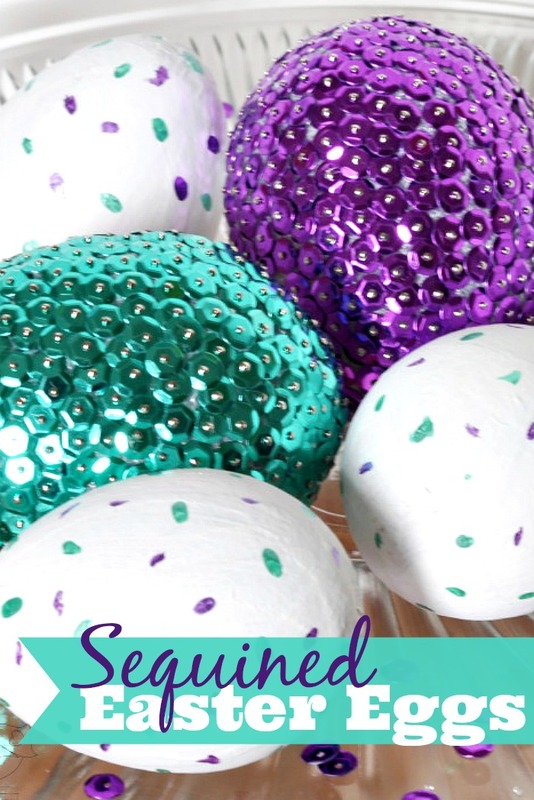 For some reason, when I was thinking about what I wanted to make for an Easter centerpiece, sequins popped into my head and stuck. Therefore, here is my Easter Egg Centerpiece – individually pinned sequins and all. The process is easy, though you will most likely prick yourself a couple times with these small pins like I did. Put the pin through the sequin hole so the curve of the sequin will be down against the egg. Push in and continue along to fill it all in. I told you it was easy! I will be honest though. 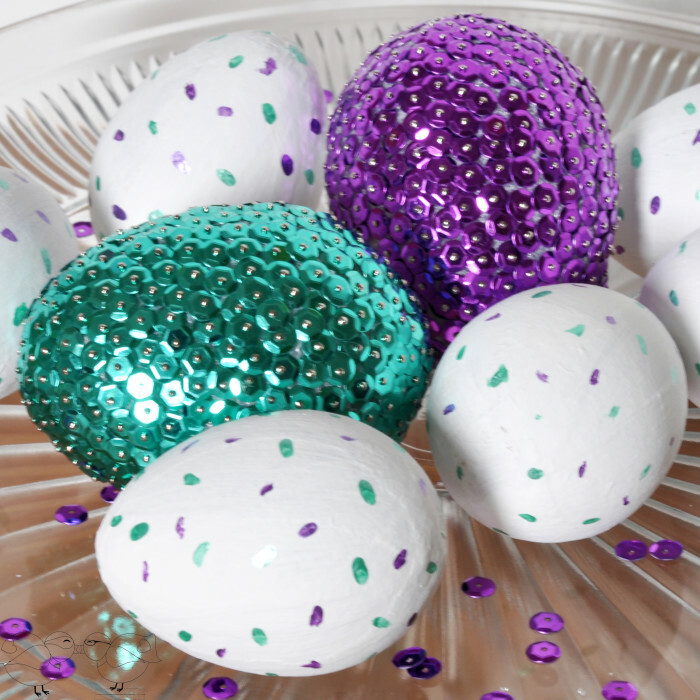 I wish I had an extra set of hands while making these because it would have been completed much faster: 1 person to put the pin through the sequin and another to add it to the egg. Then, I painted the paper mache eggs white and took a thin brush to make confetti marks on the now white eggs once they were dry. 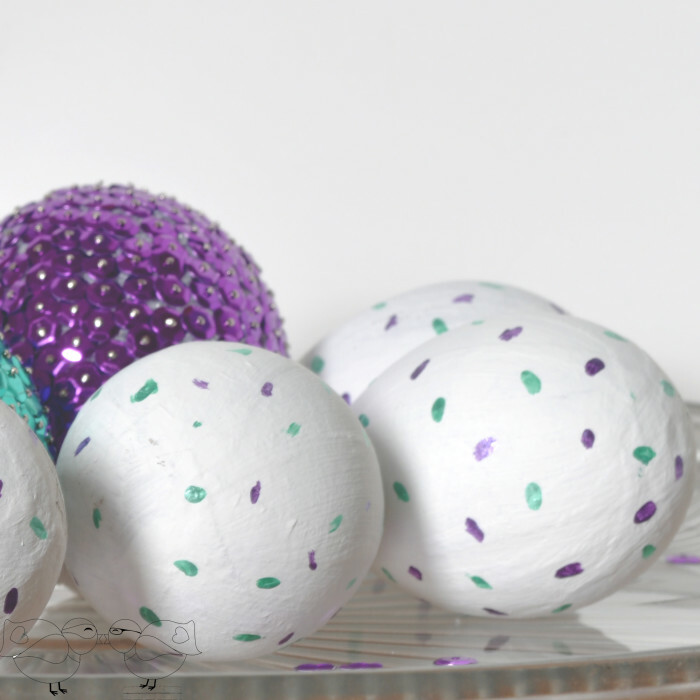 Looking for more great Easter ideas?! Check out these fabulous projects as well. Do you have a valued family treasure? Wow! I think your sequin eggs are delightful and they are especially wonderful, because of your Grandma. So cool that you were inspired by your fond memories of what sounds like a very special lady, your grandmother. Of course, you had me at sequins. Anything with a little shimmer and I’m in. Great project!!! I love anything with sparkle and the colors you chose are perfect! It’s so nice that you will be able to bring them out every year! Pinning! Those are some of the prettiest eggs I’ve seen!! 🙂 LOVE the sequins! These are really pretty. I can’t decide which ones I like more … both styles are cute! Your eggs are beautiful. A decoration made by hand that has a family story behind it is such a treasure! You’ll be able to enjoy these for years..who knows, maybe pass on to your little ones. 🙂 It’s a perfect project to share with all of our readers this week. Love these! I actually made some sequin ornaments last year in memory of my grandmother’s ornaments. 😉 I don’t know what happened to hers, I think one of my aunts has them now. Anyway- pinning each sequin on is very time consuming and cramped up my fingers- I couldn’t imagine how difficult it would be with smaller sequins! I appreciate all the work you put into them- they look beautiful. Thanks for be part of the Easter tour! I’ll bet these look great in the natural sunlight in your home. I can imagine that they really sparkle. My grandmother also made sequined ornaments and I so wish that I had some of them.